Cocoa bean pods. Photo courtesy of World Cocoa Foundation. Green product watcher Joyce Newman shares which chocolate brands are healthy for the environment and your body. Did you know the main ingredient in chocolate comes from the cacao tree (Theobroma cacao), which thrives in the hot and humid tropical rain forest regions that that wrap around the equator? The trees bear fruit in the form of brown, football-sized pods filled with sticky white pulp embedded with seeds that we call cocoa beans. 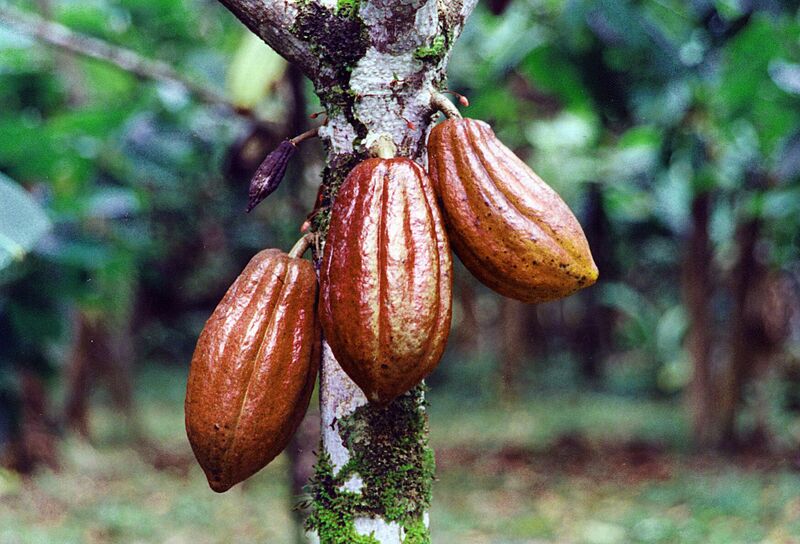 Each tree produces about 30 pods annually and each pod contains around 40 cocoa beans. It take roughly 500 beans to make one pound of chocolate. Cocoa beans are intensely bitter (in fact, the word “chocolate” comes from the Aztec word xocolatl, which means “bitter water”) but the finished product is often sweet, thanks to sugar, cream and other additives. Purchasing chocolate labeled “USDA Organic” and “Fair Trade” ensures products free of chemical pesticides and genetically engineered thickeners, with the added benefits of supporting shade-grown cacao producers and sustainable harvesting practices while avoiding child and slave labor, abusive farming practices and the tree-cutting that endangers our ever-dwindling rain forests—all concerns in the cacao industry. Photo courtesy of Thomas M. Barwick. 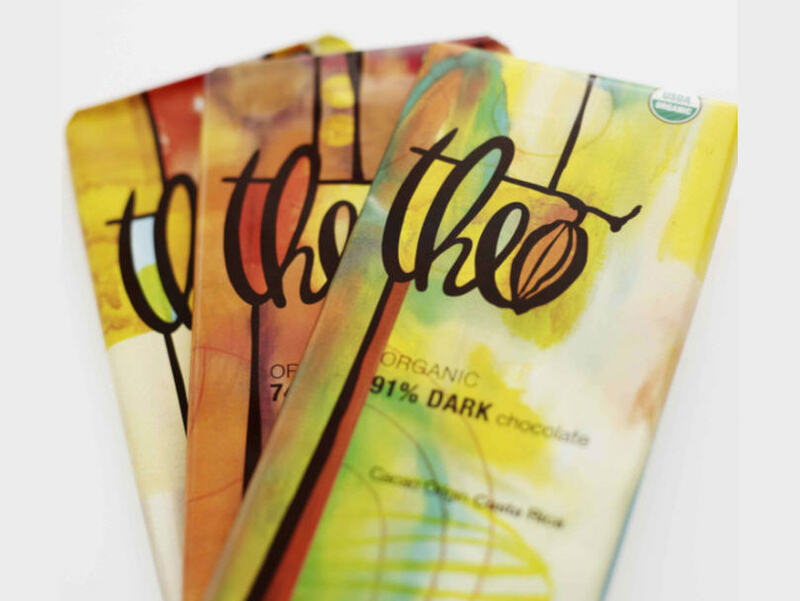 Theo Chocolate is a high-rated brand that can be found at Whole Foods or purchased online. Many boxed chocolates contain preservatives to extend their shelf life, but Theo chocolates and other organic brands don’t. Because they are preservative-free, these products often have only a ten-day shelf life. But the trade-off is candies that are certified USDA organic, fair trade, kosher, gluten-free, and soy-free. Theo’s Aphrodisiac Confection Collection (8 pieces for $17.60) has amazing handmade pieces in lemon, mint, burnt sugar, noir, scotch, and hazelnut flavors. Photo courtesy of Dagoba Chocolate. 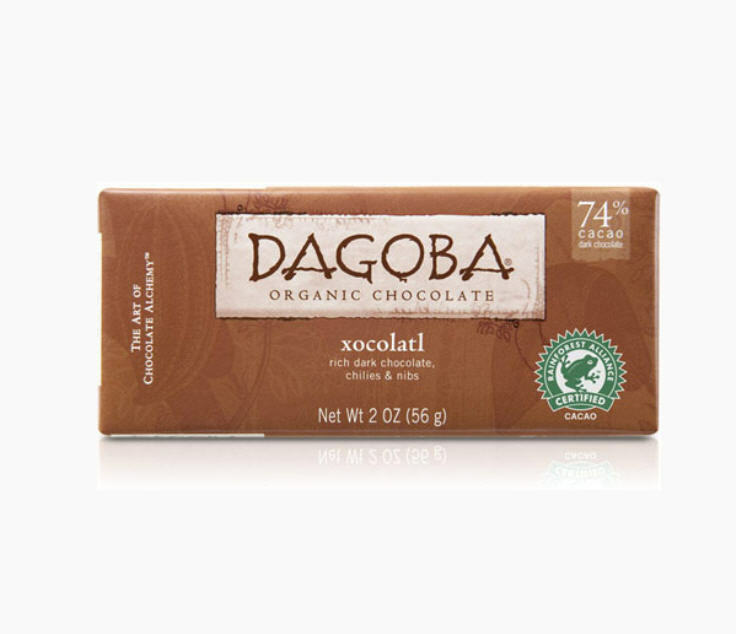 Another eco-friendly choice is DAGOBA Organic chocolate bars, which are not only USDA organic, but also certified by the Rainforest Alliance, a nonprofit organization that works with farmers in Tanzania, the Dominican Republic, and Peru to conserve biodiversity and promote their rights. The bars, available for purchase online separately or in gift collections, feature some exotic ingredient combinations, like cacao nibs and chilies or lavender and blueberries. The DAGOBA Best Sellers Gift Set ($17.95) includes New Moon, Lavender, Roseberry, Xocolatl, Milk, Dark, and Chai bars wrapped in a ribbon. If you prefer to give a homemade Valentine’s Day gift, visit their Web site for some free easy recipes for chocolate truffles and gorgeous almond fudge. Photo courtesy of Garden Variety. 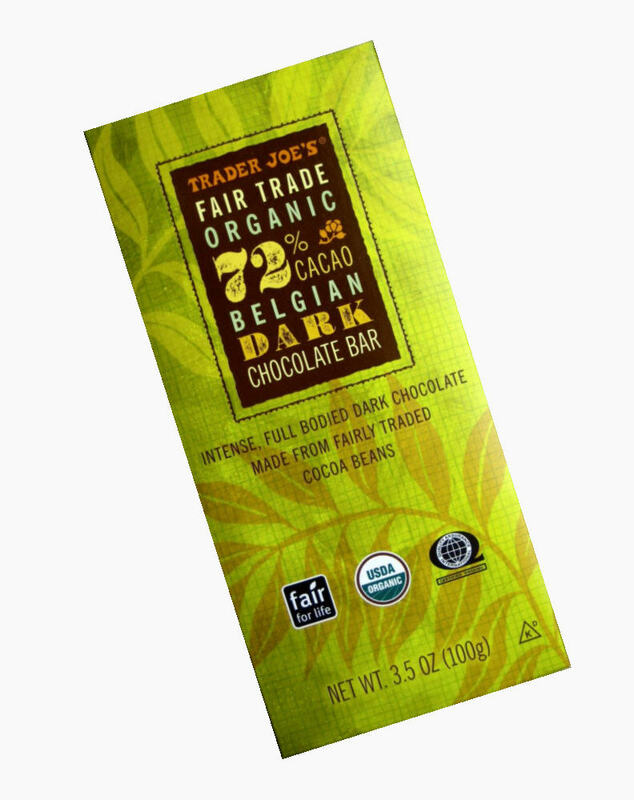 Trader Joe’s store brand fair trade, USDA organic Belgian Chocolate Bars, in milk and dark (72 percent cacao) varieties, compared well to other brands in taste tests. And their gentle price tag of just $1.99 per 3.5-ounce bar make them the best value around, ideal for making gift baskets with several bars. To stay on the healthy side, experts suggest avoiding chocolates filled with caramel, marshmallows or toffee, since they add to the calorie and saturated-fat count. But the good news is that occasionally eating a little dark chocolate can be heart healthy, something the romantics among us already knew. If chocolate happens to be your favorite vice, it may be time to shop around for a new one. Although not usually thought of as health food, mounting scientific evidence suggests that the sweet indulgence may, in fact, be a not-so-guilty pleasure. The American Dietetic Association says the flavonoid-rich dark variety is credited with keeping blood pressure down, promoting cardiovascular health, increasing beneficial HDL cholesterol and reducing the chance of blood clots—flavanols have also been shown to function as antioxidants, promote cell growth, reduce inflammation and support a radiant complexion. Plus, a study published last August in the journal Neurology showed that chocolate may help aid memory and cognitive function by increasing blood flow to the brain. And long-term research at the German Institute of Human Nutrition revealed that eating very small amounts of dark chocolate daily could slash chances of experiencing a heart attack or stroke by 39 percent. But sweet tooths beware: overindulging can have the opposite affect (chocolate in any form is loaded with calories, which contribute to weight gain, a major risk factor associated with heart problems and strokes). So, limit servings to an ounce. Bear in mind that high-sugar milk chocolate lacks the potential perks of its dark cousin and that white chocolate isn’t chocolate at all (it comes from the chocolate derivative cocoa butter). Generally speaking, the darker the chocolate, the healthier. For the perfect taste balance, look for cocoa solids in the 70 percent range, which has just the right mix of sweetness and bitterness. Home cooks in need a healthy dose of chocolate inspiration should consider picking up a copy of Camilla V. Saulsbury’s book, Enlightened Chocolate: More Than 200 Decadently Light, Lowfat, and Inspired Recipes Using Dark Chocolate and Unsweetened Cocoa Powder. This entry was posted in Food, Uncategorized and tagged baking, candy, chocolate, chocolates, cooking, fair trade, food, gluten free, GMO, GMOs, health, healthy chocolate, kosher, organic chocolate, recipes, Valentine', Valentine's Day. Bookmark the permalink. Excellent and informative post. Many thanks for the recommendations. Featuring Theo Chocolates!! They are not only wonderfully delicious, but committed to green practices and sustainable growing of cacao! If you ever find yourselves in Seattle, the tour of the factory is highly recommended!! Thanks for liking my post on vegan ice cream! It made me find your inspiring website! Looks like I need to add another book to my wish list! Too bad Xmas is still far away!